Students and Labor: Shut the City Down! Students and Labor: Shut NYC Down! NO Cuts – NO Layoffs – NO Givebacks – NO Tuition Hikes – NO Fare Hikes! 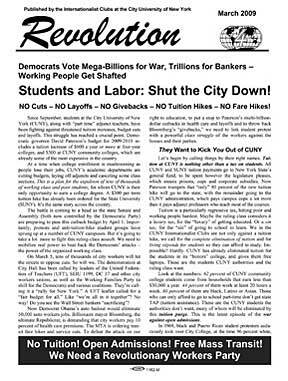 MARCH 5 – Since September, students at the City University of New York (CUNY), along with “part time” adjunct teachers, have been fighting against threatened tuition increases, budget cuts and layoffs. This struggle has reached a crucial point. Demo­cratic governor David Paterson’s budget for 2009-2010 includes a tuition increase of $600 a year or more at four-year colleges, and $300 at CUNY community colleges, which are already some of the most expensive in the country. At a time when college enrollment is mushrooming as people lose their jobs, CUNY’s academic departments are cutting budgets, laying off adjuncts and canceling some class sections. This is a plan for the expulsion of tens of thousands of working class and poor students, for whom CUNY is their only opportunity to earn a college degree. A $300 per term tuition hike has already been ordered for the State University (SUNY). It’s the same story across the country. The battle is coming to a head as the state Senate and Assembly (both now controlled by the Democratic Party) are preparing to pass this cutback budget by April 1. Importantly, protests and anti-tuition-hike student groups have sprung up at a number of CUNY campuses. But it’s going to take a lot more to fight this ruling-class assault. We need to mobilize real power to beat back the Democrats’ attacks – the power of the organized working class. On March 5, tens of thousands of city workers will hit the streets to oppose cuts. So will we. The demonstration at City Hall has been called by leaders of the United Federation of Teachers (UFT), SEIU 1199, DC 37 and other city workers unions, as well as the Working Families Party (a shill for the Democrats) and various coalitions. They’re calling it a “rally for New York.” A UFT leaflet called for a “fair budget for all.” Like “we’re all in it together”? No way! Do you see the Wall Street bankers “sacrificing”? Now Democrat Obama’s auto bailout would eliminate 50,000 auto workers jobs. Billionaire mayor Bloomberg, the ultimate Republicrat, is demanding that city workers pay 10 percent of health care premiums. The MTA is ordering transit fare hikes and service cuts. To defeat the attack on our right to education, to put a stop to Paterson’s multi-billion-dollar cutbacks in health care and layoffs and to throw back Bloomberg’s “givebacks,” we need to link student protest with a powerful class struggle of the workers against the bosses and their parties. Let’s begin by calling things by their right names. Tuition at CUNY is nothing other than a tax on students. All CUNY and SUNY tuition payments go to New York State’s general fund, to be spent however the legislature pleases, which means prisons, cops and corporate subsidies. Now Paterson trumpets that “only” 80 percent of the new tuition hike will go to the state, with the remainder going to the CUNY administration, which pays campus cops a lot more than it pays adjunct professors who teach most of the courses. Tuition is a particularly regressive tax, hitting poor and working people hardest. Maybe the ruling class considers it a luxury tax, for the “luxury” of getting educated. Or a sin tax, for the “sin” of going to school to learn. We in the CUNY Internationalist Clubs are not only against a tuition hike, we call for the complete elimination of tuition and for living stipends for students so they can afford to study. Impossible? Hardly. CUNY has already eliminated tuition for the students in its “honors” college, and gives them free laptops. These are the students CUNY authorities and the ruling class want. Look at the numbers: 62 percent of CUNY community college students come from households that earn less than $30,000 a year. 44 percent of them work at least 20 hours a week. 80 percent of them are black, Latino or Asian. Those who can only afford to go to school part-time don’t get state TAP (tuition assistance). These are the CUNY students the authorities don’t want, many of whom will be eliminated by this tuition purge. This is the latest episode of the war against open admissions. In 1969, black and Puerto Rican student protesters audaciously took over City College, at the time 96 percent white, demanding that admissions reflect the composition of city schools. After two weeks of sharp struggle, the powerful city unions weighed in demanding that all high school graduates in New York be accepted at CUNY. Enrollment soared as hundreds of thousands of the children of New York City’s multi-ethnic, multinational working class headed for CUNY. Remedial and bilingual classes were established to help the students who had been shortchanged by overcrowded, underfunded, and de facto segregated public schools. But in 1975-76, the Wall Street banks established an emergency dictatorship board over all New York City government in order to gouge the workers to pay for another economic crisis. They shut down CUNY for two weeks when the faculty refused to work without pay. The president of CUNY called for five campuses to be closed – pointedly including Hostos and Medgar Evers community colleges, which served the oppressed Puerto Rican and black communities of NYC. Once the CUNY student body was majority non-white and poor, the “tuition” tax was imposed for the first time, like a poll tax, and has steadily increased ever since. This is the gang that has been pushing for tuition hikes since long before the economic crisis broke. The capitalists are not against public education in general, they just want it to serve their profit system. They’re pouring billions into the City University capital budget, which is a bonanza for the construction companies. When the leadership of the CUNY faculty union, the Professional Staff Congress (PSC), calls on the government to “invest” in CUNY, they omit that the bankers’ government will invest on its own class terms, which has nothing to do with making CUNY accessible to working class and poor students, oppressed racial minorities, or immigrants. Meanwhile they pay adjunct professors, who make up well over half the CUNY faculty (two-thirds in the community colleges), poverty wages, barely $20,000 a year if they’re lucky enough to get at least six courses. Now the administration is cutting back on the number of sections in what amounts to back-door layoffs and pay cuts. Students should wholeheartedly support the struggle of CUNY Contingents Unite, which advocates for adjunct faculty in the PSC, to eliminate the two-tier academic labor system. What’s needed is for student protest to become part of a class struggle against the Democrat-Republican regime of cutbacks and war. Yet many union leaders and various leftist groups seek to deflect the struggle by appealing to the Democratic party of budget cuts and imperialist war. There is the PSC tops’ call on Paterson to “invest in CUNY.” They are also pushing for the so-called “millionaire’s tax,” as is the International Socialist Organization (ISO) and other reformists with their calls to “tax the rich.” There is nothing the least bit radical about raising state taxes from 6.85 percent to 10.3 percent on incomes above $250,000 – the New York Times and other bourgeois spokesmen are all for it. And even if it passed, they’ll still use the money to bail out the banks and screw working people. Earlier, the ISO came up with a petition, being circulated by the Hunter Student Union, calling for Hunter College president Raab to “come out against tuition hikes and support student activities in opposition to the tuition hikes.” Jennifer Raab was a political flack for Mayor Rudolph Giuliani who was appointed in 2001 over the opposition of even the tame Faculty Senate. She was praised by the right-wing New York Observer (24 December 2000) for her support for the 1999 Schmidt report, which she called “a blueprint for reform.” Raab is part of the Goldstein team that’s behind the plan to continuously raise tuition. To call on her to support student protests against that can only promote illusions. City University students, staff and low-paid contingent faculty are not alone. Workers throughout the city, particularly in the strategic Transit Workers Union Local 100 and health care workers, face cutbacks and job losses. Following a December 16 PSC rally outside Governor Paterson’s Manhattan office, we marched to a rally of TWU members opposing layoffs and a fare hike. A student takeover of one or more CUNY campuses, backed by faculty and with significant labor support could galvanize whole sections of the city population to fight against budget cuts and a tuition hike. In any fight you need to be clear about who are your friends and who’s the enemy. From Albany to Washington, the Democrats are in control. They’re voting hundreds of billions to continue the colonial occupation of Iraq and what the Obama administration is calling the “Afpak” war (in Afghanistan and Pakistan). The Democrats and Republicans unite to shovel trillions into the banks’ vaults and bail out the Detroit auto companies, but they shaft auto workers, city workers, hospital workers, students and poor people, while staging Gestapo-like raids kidnapping masses of immigrant workers and locking up millions of blacks and Latinos. Working people didn’t cause the economic crisis, and we won’t pay for it. The Wall Street panic and mass unemployment are caused by the nature of the capitalist system itself. Talk of “shared sacrifice” is sucker bait – don’t buy it! To fight the exclusion of tens of thousands of students from the largest urban public university in the U.S., which has graduated more minority students than any other institution of higher education, we need to forge a fighting alliance with workers and all the oppressed. That is how to beat back the lords of capital and turn defensive struggles into a fight for power against the system of war, racism and poverty.